Mostly cloudy. A stray shower or thunderstorm is possible. Low 49F. Winds light and variable..
Mostly cloudy. A stray shower or thunderstorm is possible. Low 49F. Winds light and variable. Whitehall's Main Street on Saturday morning. In the distance, Elizabeth Robinson takes time to tell a passerby about Whitehall's Chamber of Commerce new location at 130 Main St. A small group is asking for a feasibility study to dissolve the village. A meeting will be held at 6 p.m. Tuesday at Village Hall. The public marina in front of the Skenesborough Museum and Whitehall Welcome Center are seen Saturday morning. During the summer elaborate, multi-million dollar yachts dock here with free electricity and showers available for village boating visitors. On Saturday morning a young couple checks out some online media from the pavilion along the canal in Whitehall's Riverside Park on Main Street. A colorful welcome to the village of Whitehall along Route 4. A handful of residents are trying to spark interest in dissolving the village. A view of Whitehall's Main Street from the bridge that connects the east and west side of the historic village on Saturday morning. Historic Grounds on Main Street in Whitehall is famous for it's coffee and breakfast and lunch offerings. On Saturday morning, like most Saturday mornings, it had a steady stream of patrons. 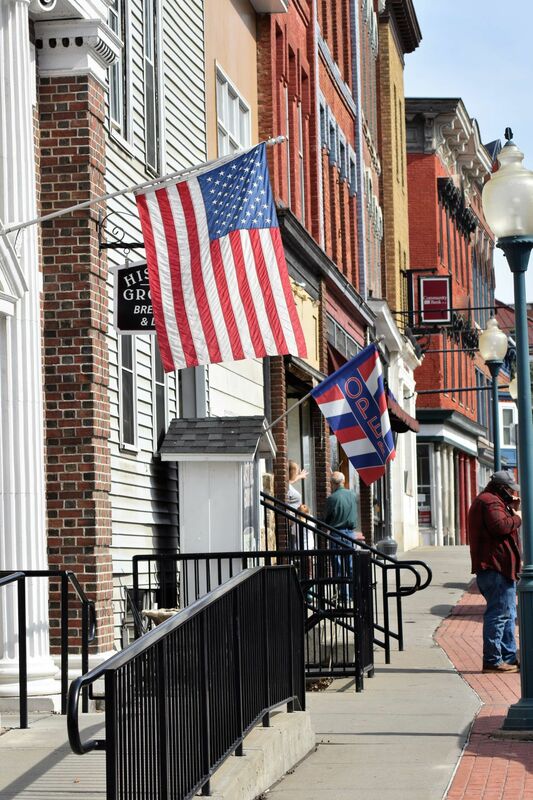 A welcome to the historic Village of Whitehall along Route 4. A handful of residents are trying to spark interest in dissolving the village. Skene Manor sits prominently above the Village of Whitehall. WHITEHALL — There’s something wistfully seductive about a Saturday morning in the village of Whitehall. Like a vintage postcard moment, the pace is slow as sun glints on the water of the canal slicing right through the center of the village. There’s the high school teacher who lives on Williams Street, walking her chocolate lab across the bridge, past Main Street and left onto Broadway. There’s the young couple laughing and flirting in the pavilion next to the fire station on Main Street in Riverside Park. And there’s the heavy traffic in and out of the increasingly popular Historic Grounds, a breakfast and lunch spot built inside an historic bank. Make a pass from Main Street over the bridge to Williams Street, each fronting opposite sides of the canal at Lock 12, and the historic beauty of what some might call a bygone era remains in the architecture created near or before the Civil War. For several years, the 4.8 square mile village struggled with the challenges of homeowner flight, shuttered storefronts and business closings. But a quiet revolution by homeowners and entrepreneurs is beginning to show, as vacant properties are getting scooped-up and restored to single family homes or small businesses, especially along both sides of the Champlain Canal. Such new sprouts, in a village long overdue for some good news, are garnering attention from out of town and foreign boaters who often dock along the canal. Nonetheless, a small cadre of dissenters, is pushing for the dissolution of the village, in favor of joining with the town of Whitehall. Robinson moved into the village three years ago, she said. According to village Mayor Phil Smith, resident David Molenaar came to the last board meeting to say he had already contacted the New York Department of State to come to a meeting with the village. Regarding the dissolution, “The board is not pushing or encouraging this,” he said. The meeting is slated for 6 p.m. on Tuesday in Village Hall. According to New York Deputy of State for Local Government Mark Pattison, one of his staffers, Carl Ublacker, is coming to the April board meeting for a discussion about resources and available grant money for a feasibility study on the issue. Pattison said that a study can help a village know more about whether to go forward. Robinson, who first discovered Whitehall as a boater, points out the new Whitehall Chamber of Commerce location at 130 Main St., and said her Airbnb season opened on Saturday. “I’ve got a reservation at 11 a.m. They bring money to the village. Tourism is our future,” she said, adding that Whitehall needs to cater to the boaters who dock sometimes multi-million dollar yachts along the canal. Two weeks ago, The Post-Star received an anonymous letter regarding the initiative to dissolve the village with several local businesses listed as contacts. According to Mayor Smith, the dissolution initiative is being led by Molenaar who recently lost his bid for village trustee to a write-in candidate. In 2018, Molenaar pushed for dissolution of the village police department and in 2017, asked the Village Board to look into police cuts. Molenaar could not be reached for comment.